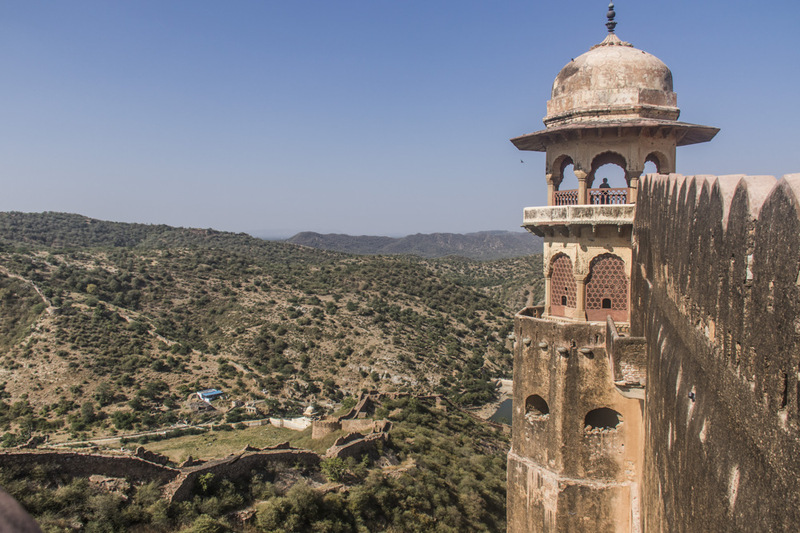 The Jaigarh Fort, located on one of the peaks of the Aravalli range of hills is built about 400m above the Amber Fort. A part of the great wall can also be seen. The fort was built by Jai Singh II in 1726 and was named after him. Ayush Basu: One better hold on to his/her cap here, Larry! Really liking this picture, Ayush. Ayush Basu: Thank you Ray, it was hard not to take this shot. Ayush Basu: You have a sharp eye, Sherri. Thank you for the comment. Ayush Basu: It really is, Michael. I was here for quite a while, enjoying the solitude. Apart from the fort, this could be Arizona, Ayush. Ayush Basu: I think I know what you mean, from your and Elizabeth's images, Frank. Magnifique composition avec cette tour. Ayush Basu: Merci, Martine. I am pleased you like it. A great vantage point, it is enormous! Ayush Basu: It really is, Chris. I was here for quite a while, enjoying the solitude. An impressive fortification and an impressive image Ayush. I am drawn to the small blue roof shelter. Ayush Basu: I am not aware what it is, Chad. I did feel suitably dwarfed by the ramparts of this place. Quite a view and you made a great picture of it. Ayush Basu: One better hold on to his/her cap here, Louis. That wall is something else! Ayush Basu: I did feel suitably dwarfed by the ramparts of this place, Mary. This is just so Indian, what a greta place to visit. Ayush Basu: It was my first time to visit this province, Brian. My parents and brother have had /made the opportunity to visit this in the past. A pretty scrubby landscape - doesn't look very productive, so I wonder what the main economic effort is?? Ayush Basu: I am told that point an agriculture point of view, there are crops suited to this landscape that thrive despite low water supply. In addition, mining and cement manufacture power the economy. Yjay's some vantage point.A very good defensive position, I should think. Ayush Basu: Oh yes, the defenders would be able to pick off any attackers with considerable ease, Alan. Wow the drop from the top is so high! Must be scary to stand close to the edge! Ayush Basu: There are sufficiently tall ledges, LC. But there are also several devices built into those walls which would make it considerably difficult for attackers to be successful. Talk about a vantage point!!! Ayush Basu: All the best to the one approaching the fort from down there, Ginnie! Ayush Basu: I would not want to be one approaching the fort from down there, Lisl! You can spot the enemy from miles, Ayush.. LOVE this view. I can imagine you were there a long time. Ayush Basu: It was really nice to be up there with relatively a few number of people, Astrid. Yes, you could see them and, at your ease, take them "off"! Sounds wicked, doesn't it? So yes, from this shot you can clearly note that it is a fort. Ayush Basu: Yes, Claudio - it sure is inspiring, isn't it?